KNIGHTSTOWN, Ind. 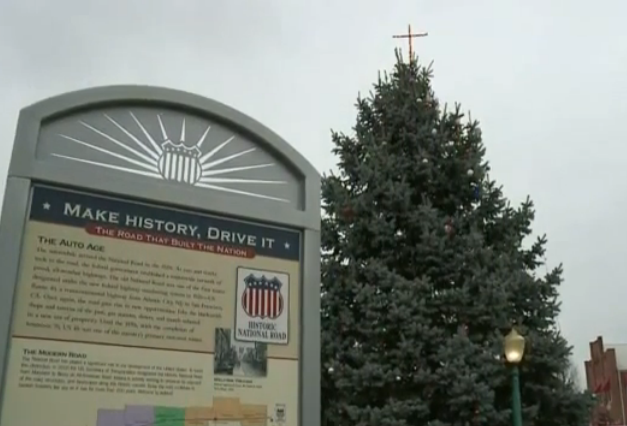 -- The American Civil Liberties Union is suing a central Indiana town over the display of a cross as part of its Christmas decorations. The Indianapolis Star reported that the ACLU’s Indiana chapter and Knightstown resident Joseph Tompkins argue that the Christian symbol on display in the Knightstown town square violates the First Amendment. The lawsuit is seeking for removal of the cross, monetary damages and declaration that the cross display violates the First Amendment. CBS affiliate WTTV reported that the suit alleges that the Latin cross “is the preeminent symbol of Christianity, representing the instrument of the crucifixion of Jesus.” So if the display is religious, the suit argues, it has no business on town property. Court documents say that the illuminated cross is atop a large evergreen tree and has for a number of years. The documents say there are no other holiday decorations on the square. The documents go on to say that every day, Tompkins “is forced to come into direct and unwelcome contact” with the cross on top of the tree as he drives through town. This, the suit says, has caused him “irreparable harm,” which can only be remedied by taking the cross down and paying Tompkins monetary damages. “You gotta sit down and talk about it before you file the lawsuits,” said Knighstown resident Kevin Richey to WTTV. The town of about 2,200 residents is about 40 miles east of Indianapolis. Town officials didn’t immediately respond to requests for comment from the newspaper or The Associated Press.